In this blog, Greg O’Donnell and colleagues at Newcastle University explore the transition to the urban catchment, and the resulting effects on hydrology. Cities have hydrological impacts both within their boundaries and beyond. Through the conversion of the landscape from permeable to impervious surfaces, runoff dynamics are changed resulting in more flashy responses in urban watercourses and alterations to groundwater recharge (McGrane, 2016). Water demands have resulted in hard infrastructure at distance from the cities they support, including reservoirs and waste water systems. Additionally, demands for food have resulted in land use change/agricultural intensification. Such has been the change to the water cycle, we are now in the era of the Anthropogenic Catchment (O’Connell et al., 2007). 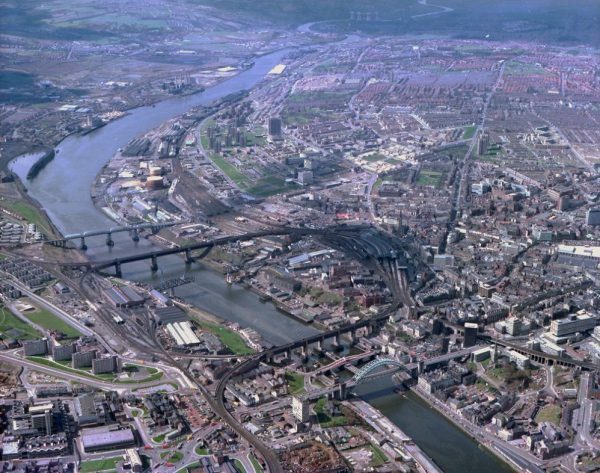 Newcastle upon Tyne has an area of 114km2 and population of 295,000 people. Taking the UK average water usage of 150 litres per person per day, roughly one tonne of water per week (Defra, 2008), the city imports 16giga litres of water per year (excluding industrial consumption). The Kielder and Derwent reservoirs, located within the Tyne catchment, supply Newcastle and the wider area with domestic water supply. Urban storm runoff and sewerage are transferred from the city to the Howdon treatment works, which can process 12,000 litres of water per second. There is an urgent need to understand the interaction between the natural and engineered water cycles to support future sustainable development. The Ouseburn is the main urban river within Newcastle, with an area of 65km2, draining through the north and eastern districts of the city to the Tyne. Although the reliability of early estimates is uncertain, it has been estimated that the population of Newcastle increased from 14,000 in 1700, 90,000 in 1850, to the current total of 295,000. We are investigating the within boundary hydrological changes due to land use change associated with increased urbanisation. Figure 1 below shows the 1859 and present-day land use for the Newcastle area. The Ouseburn is gauged at Woolsington and Crag Hall. Over the last ~150 year, the land use of the catchment has changed from predominately arable to approximately 50% urbanised as the city has expanded northwards. However, the Town Moor (400ha) has remained relatively intact, now forming a central grassland area surrounded by suburbs. Impacts of this change have been preliminary explored using a hydrological model. The hydrograph below (Figure 2) shows the Ouseburn flows at Woolsington, under several scenarios; a wooded ‘prehistoric’ catchment (0.0% urbanised), 1859 land use (1.5%), current land use (LCM2007; 50%), and a future state (70%). 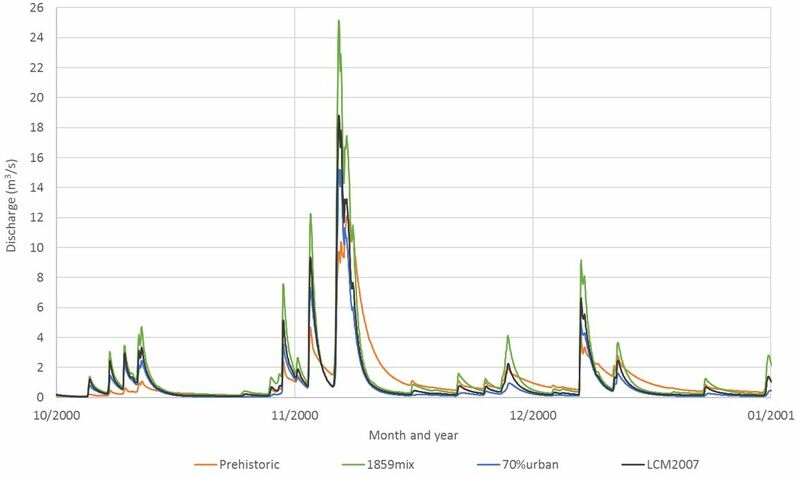 It can be seen that as urbanisation increases the flood peaks increase and the recession limbs of the hydrographs steepen (compare the LCM2007 with the prehistoric hydrograph). However, it is interesting to note that the 1859 scenario produces the largest flood peaks. This is because in later time periods the runoff from the urban area is transferred outside of the catchment via the storm drainage system to the Howdon works, bypassing the stream network. 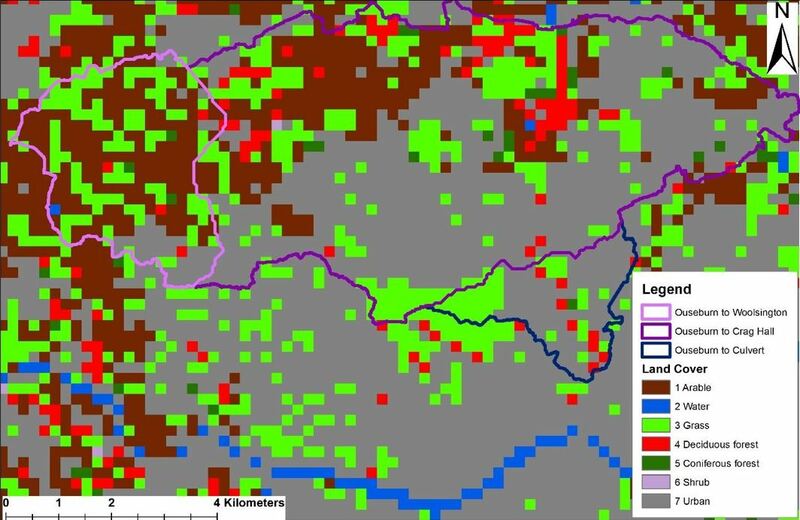 The 1859 versus the prehistoric scenario therefore shows the impact of land use change, with agricultural practices including the underdrainage of fields causing more flashy runoff. Future work will involve the coupling of the hydrological model, to represent the rural area, with a hydraulic model that is capable of better simulating the urban environment, through the explicit representation of individual buildings and the urban drainage network. We hope that this will enable us to improve our understanding of the complex hydrology in urban areas, which is required to underpin future sustainable development. Greg O’Donnell is a Research Assistant at Newcastle Unversity, working on the EPSRC Urban Flood Resilience project. Greg would like to acknowledge the support of Stephen Birkinshaw, Daryl Hughes, Chris Kilsby and Vassilis Glenis in the production of this blog. Butler, GA (2012). Disease, Medicine and the Urban Poor in Newcastle-upon-Tyne, c. 1750-1850. PhD thesis, University of Newcastle. Defra (2008). Future water: the Government’s water strategy for England, Stationery Office. McGrane, S. J. (2016). Impacts of urbanisation on hydrological and water quality dynamics, and urban water management: a review. Hydrological Sciences Journal, 61(13), 2295-2311. O’Connell, P. E., Ewen, J., O’Donnell, G., and Quinn, P (2007). 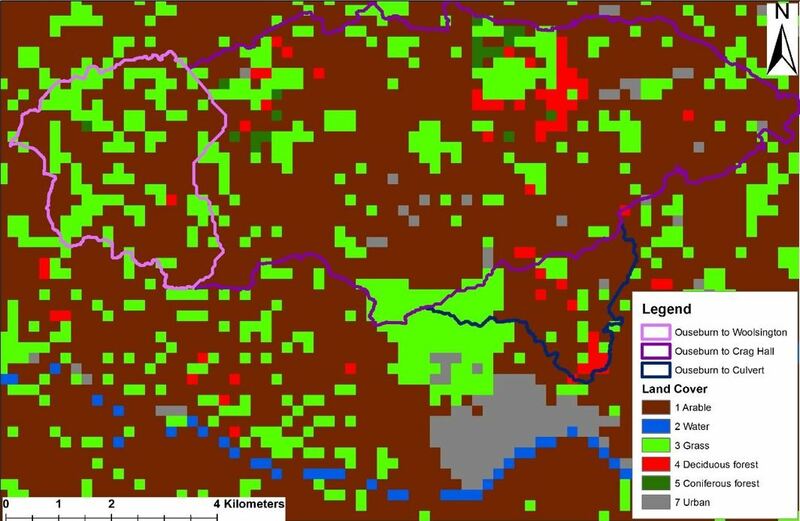 Is there a link between agricultural land-use management and flooding?, Hydrol. Earth Syst. Sci., 11, 96-107. How are transport networks going to become more resilient to flood risk?